Home > Cusody/Child Support > What Is Constructive Emancipation For Child Support In New York? In New York, parents are obligated to pay basic child support and add-on expenses for their child until the child turns 21, unless the child is “emancipated” before the child turns 21. New York State law defines legal emancipation as a child attaining the age of 21. However, there are events that may occur that would prompt a Court to determine that parents are no longer obligated to pay child support for their child, even if the child is under the age of 21. The occurrence of any of these events is sometimes referred to as “constructive emancipation”. The principle underlying “constructive emancipation” is that when certain events occur, the relationship between the parents and child is altered in such a way that the parents should no longer be obligated to pay child support for that child. Becomes economically independent from his or her parents, such as getting a full time job. Voluntarily, and without cause, abandons the custodial parent’s home, against the parent’s will, for the express purpose of avoiding parental control. In these situations, New York courts have held that by taking these actions, a child may have has forfeited his or her right to support from the parents. Getting married and joining the military are clear and well-defined events that give rise to a child’s emancipation. Establishing that a child has achieved economic independence or that a child has abandoned the parental home can be more difficult to prove. Economic Independence. Under New York’s Child Support Standards Act, when a child is working full time and is self-supporting, he or she may be deemed economically independent from his or her parents. The challenge with which Courts and parents are faced comes in determining if the child is making enough money to fully support him or herself. For example, if the child is earning full-time wages, but still needs financial support from a parent to pay for living needs, like food, shelter, or utilities, he or she is not emancipated. This will likely be the Court’s holding even if the child is not living with either parent; in fact, Courts have held that as long as a child still needs financial support, the child cannot be deemed emancipated for child support purposes. It is rare for the conduct of a child to lead to the termination of child support. Abandonment cases are harder to prove than economic independence cases because they can be extremely subjective. In New York, the courts have held that a child’s right to support and the parent’s right to custody/visitation with the child are reciprocal. This means that it is perfectly acceptable for parents to impose reasonable regulations upon their child and to demand that the child visit with the parent. If the child leaves the parent’s home voluntarily to avoid these regulations, his or her support may be terminated – as long as the abandonment was without cause. Abandonment applies to custodial parents as well as non-residential custodial parents. In the case on non-residential custodial parents, if the child unreasonably refuses all contact and visitation, the parent may be permitted to cease paying child support for the child who unreasonably refuses to have contact with the parent. Parental Alienation. One reason that abandonment cases may be much more complicated in cases of constructive emancipation is due to the fact that parental alienation may be the reason for the child’s constructive emancipation. In this context, parental alienation means that one parent is systematically destroying the relationship between the child and the other parent by portraying the other parent in a negative way until the child adopts this belief, as well. When parental alienation occurs, and a child refuses to have any contact with a parent due to the conduct of the other parent, Courts have allowed the cessation of child support where the Court determines that reconciliation between the parent and the child is impossible. Another factor in deciding whether a child should be deemed emancipated based on the doctrine of constructive emancipation is the cause of the child’s constructive emancipation. If a parent is seeking to terminate his or her child support because the child has abandoned the parent’s residence to avoid parental control, or the child refuses to have any contact with the parent, the court will want to why the child has undertaken this course of action. This information will help the court to determine if the child had good cause for his or her actions. If good cause is shown, the child may still be eligible for support from the parent even if the child continues to refuse contact with the parent. Cause is particularly important if the parent seeking to terminate support is the non-residential custodial parent (the parent with whom the child DOES NOT live for the majority of the time). If the problem between the parent and the child can be traced back to the actions of the non-residential custodial parent, it is likely that the Court will deny the parent’s application to terminate support. Case law makes it clear that if the parent caused the breakdown in communication between the parent and the child, the child will not be deemed to have abandoned the parent, and the parent will be obligated to continue paying support. 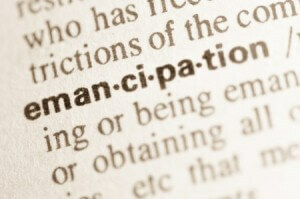 The doctrine of constructive emancipation is most often used as a way to modify or terminate child support orders. In order to modify a child support order, the parent seeking the modification of the order must demonstrate that there has been a substantial change of circumstances from the time of the Court’s most recent order. A change in circumstances must be proven before the parent can attempt to advance his or her constructive emancipation claim seeking to modify child support. If a change in circumstances is proven, then the burden of proof for proving that constructive emancipation falls to the parent seeking the modification. Seeking to terminate child support based upon constructive emancipation is a drastic step. Because these claims could result in financial hardship for the custodial parent and the child, Courts examine such claims very closely and delve deeply into the true reasons for the breakdown of the parent-child relationship. If you are considering making an application to modify or terminate your child support obligation based upon constructive emancipation, or if you are a custodial parent who has been notified that the other parent is taking such action, contact our family law office at 914-361-5500 right away. Our attorneys are devoted exclusively to family and matrimonial law and have the skills and knowledge to advise you through this complicated legal step.